This is one of those recipes that when you see it, your interest is immediately piqued and you set about bookmarking it in your mind to make sometime. I then saw it floating around the interwebs last week and knew it was a sign. I was already buying cauliflower to make the best ever whole roasted cauliflower recipe, so added another to my basket for this. I was recently given a stunning wedge one of my favourite South African cheeses, The Dalewood Fromage Huguenot. It’s a 12 month old mature cheese that recently won The South African Dairy Product of the year award and I knew I wanted to use it in a beautiful recipe. It has a distinctly nutty flavour and creamy texture, but sadly can only be procured at the Dalewood farm shop on the Franschhoek-Simondium Road in the Winelands. You may of course also find it on the menu in a top local restaurant. Rumour has it that Peter Templehoff from the Greenhouse buys up most of the stock each year and it was there that I tasted it for the first time. This recipe comes from one of my all-time favourite cookbooks Plenty More by Ottolenghi and is filled to the brim with the most delicious vegetarian recipes. This – along with Plenty, are two must-have cookbooks for your collection. Whether you are a vegetarian or not. There is a little effort required to making this cauliflower cake, but its well worth every minute you spend. As is typical with many Ottolenghi recipes, the list of ingredients seems long but are so carefully orchestrated. I would never have thought to use rosemary they way he did here, but that small amount adds a certain earthy depth rather than over taking the flavour as rosemary often can. The basil gives this freshness, and the hint of turmeric a lovely vibrant colour. I used half the Dalewood Huguenot and half Parmesan to make up the cheese quotient and it was delicious. I loved how the sprinkled nigella and sesame seeds created some crunch on the bottom of the cake. It was such a special recipe, I rushed it over to my family to share for dinner and they were in raptures over it. This one is a keeper and I cant wait to make it again. Its soft and fluffy but firm enough to hold well together so this is also the perfect picnic food. Utterly delicious. This is the perfect dish to make if you are looking for a fancy vegetarian main course but would sit very comfortably on a brunch table. ~Cooks notes – in the book the recipe indicates 200c / 180c – so I’m not entirely sure why there are 2 temperatures mentioned. I baked my cake at 180C as I tend to do most of my baking. I found it needed a little longer than 45 minutes to cook right through the middle. I also covered it loosely with foil about 3/4 of the way through the baking time as I wanted to ensure there was no over-browning. I do this for photography purposes mainly, but also because I generally I prefer my baked things golden rather than over browned. Preheat the oven to 180C / 400°F. Cook the cauliflower either whole or in florets in a large pot of boiling salted water. Simmer for 15 minutes until the cauliflower is soft and cooked through. Drain in a colander. (I made this the day before). Cut 4 round slices, each 1/4-inch/5-mm thick, off one end of the red onion and set aside. Chop the rest of the onion and place in a small pan with the oil and rosemary. Cook for 10 minutes over medium heat, stirring from time to time, until soft. Remove from the heat and set aside to cool. Beat the eggs - either in a stand mixer, or using an electric whisk or by hand using a whisk until light and fluffy. Add the basil, flour, baking powder, salt, pepper and tumeric, and mix until you have a smooth batter. By hand fold through the onion and olive oil mix and the cheese. When that is well combined, add the cooked and cooled cauliflower florets and mix lightly to thoroughly coat. Be careulf not to break up the flortes too much. Line the base and sides of a 9 1/2-inch /24-cm springform cake pan with baking paper and brush the sides with melted butter. Mix together the sesame and nigella seeds and sprinkle them around the inside of the pan so that they stick to the sides. Pour the cauliflower mixture into the pan, spreading it evenly, and arrange the reserved onion rings on top. Place in the center of the oven and bake for 45 - 50 minutes, until golden brown and set; a knife inserted into the center of the cake should come out clean. Remove from the oven and leave for at least 20 minutes before serving. It needs to be served just warm, rather than hot, or at room temperature. Aren’t the two temperatures for fan and non fan ovens. Fan ovens always 20% lower ?! Hi Fiona, yes it could be but it doesnt specify. My oven is fan forced and I find despite this it bakes in a similar way to my conventional oven at the same temperature. Sam this is so good! I followed this on snapchat – it looks really tasty – what it’s like cold? Or should it be served hot? HI Angela, we ate it just lightly heard up but he recommends eating it at room temp or just off. There were no leftovers after my family devoured them on the night, but I can imagine this would be ridiculously tasty cold the next day. Very interesting recipe! The cake looks delicious! I keep seeing this pop up on pinterest and have been meaning to try it for ages so it is good to know that it tastes as good as it looks! 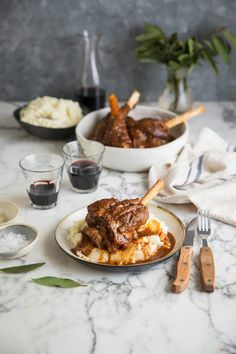 I spotted this beauty over on Pinterest and had to pop by to check out the recipe. Everything about this is lovely! I’m dying to make it for brunch. This I must have now!!! I am making it tonight even though it’s 90 degrees outside. Hi! Would you recommend using almond flour for a carb and gluten free alternative to normal flour? Hi. I havent tested this recipe using those flours but I suspect they wont work by directly replacing them. Flour contains gluten which is very different to almond flour. Thanks Ani, Im so glad you enjoyed the recipe. Hey! Do you think it is possible o bake without flour? Or can you recommend any alternatives? Hi Marie – Im not too sure as I havent tried with any other flour and I wouldnt suggest swapping any flour out. I dont have much expereince working with flour substities as if a recipe needs flour I just use that. I’m excited for this to come out of the oven! But I’m also winging it a bit with the time and temp. I preheated to 400 as per the recipe but google tells me that 180 Celsius is 356 Fahrenheit… not 400? Fingers crossed! I hope it worked out (I’m sure it did) and you loved it. Thank you – yes, it turned out great! Will definitely be making it again. I covered it as per your note and at 45 min it was perfect.